Coverage: The lens should cover the cornea in primary gaze and in all positions of gaze. If the CL covers whole cornea it is considered as complete coverage. 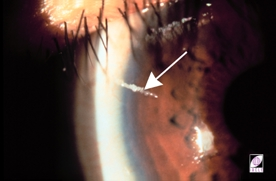 If the CL does not cover whole cornea then it is considered as partial coverage. A binasal system is most commonly used method to record centration. 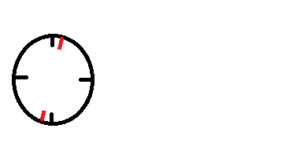 The location of the geometric center of a contact lens, within the graph is the basis of the description of its centration. In this system nasal decentration of both eyes is taken as positive, temporal is taken as negative,superior -positive and inferior-negative. Down gaze: Measure the CL periphery which is out of cornea superiorly. 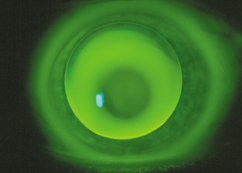 Horizontal gaze: Measure the CL periphery which is out of cornea temporally and nasally. 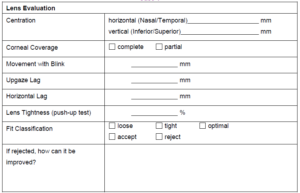 Tightness: This is assessed by push up test. 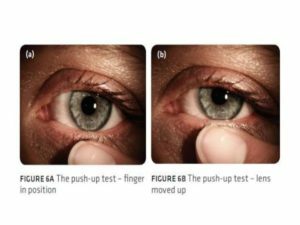 When the eye is in primary gaze position, the practitioner moves the lens up with the pressure of thumb on the lower eyelid. The practitioner assess the relative ease with which the lens is displaced and the speed of its recovery to its original position. Recording:Recorded in grade ranging from 0% to 100%. 100 indicates tight and 0 indicates loose fit.The optimum fit would have 40% to 60% of tightness. Effect of blink: If the fit is steep the vision would be clear after blink and for a flat fit the vision would be clear before blink. For an optimum fit there won’t be of much difference between before and after blink. Comfort: Ask the patient about his /her comfort on a scale of 1 to 10. 1 being the least and 10 being the most comfortable. This would certainly lead us to the type of fitting. 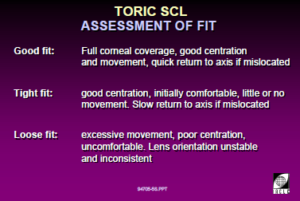 Fitting assessment of soft toric is same as soft spherical contact lenses except lens rotation. Rotation : When we insert a lens in the eye there may be two situations, It may be in the same position during the blink and after the the blink. It may displace during the blink but may retain its location after the blink. It may not be in the same position it moves because of blink effect. 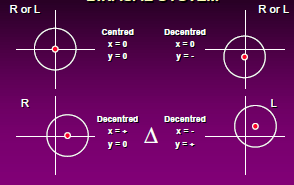 If it rotates, the axis may rotate, So to avoid this cylinder in unwanted axis we add or subtract the amount of rotation to the axis of the prescription so that the axis of the cylinder coincides with the axis of the eye. 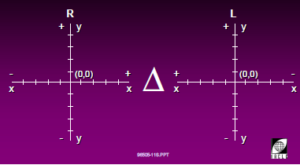 If the lens moves towards right subtract the degree of mis location to the Rx axis. If the axis is at 6 o clock then there is no need of adding or substracting. In the second picture it has moved towards right (right side of the practitioner) by 10 so substract 10 from actual prescription axis. In the third picture it has moved towards left (left of practitioner) by 10 so add 10 to the prescription axis. Under the lid fit/lid attached fit: When the lens is partially covered and held in position by the upper eyelid. 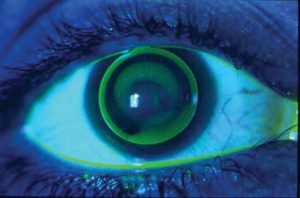 This is observed when lens is usually larger and BOZR is fitted either aligned with or slightly flatter than the cornea. 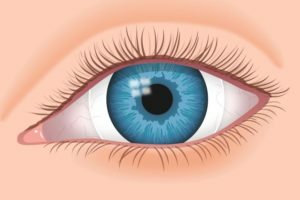 Inter palpebral fit: When the resting position of the lens is between the upper and lower lids. 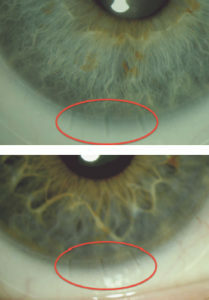 This is observed when lens is usually smaller than interpalpebral aperture and BOZR is usually steeper than the cornea. Low riding: The contact lens is decentered Inferiorly. During the blink if the lens moves along with lid but does not cross limbus and if the other characters are optimum it can be dispensed. It is influenced by blink. Rocky: The lens tendency is to rock around the flatter meridian of the cornea. Mostly in case of tight fit . Judge the stability only after adequate degree of adaptation has achieved. It describes the physical relationship between the base curve of lens and anterior curvature of cornea. This is done while the CL is resting on the cornea without any movement. Flouroscein staining plays a very important role n static fitting. There are two words which clearly define static fitting are Pooling/Clearance, Bearing/touch. 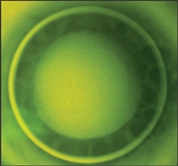 Pooling: Accumulation of tears in space between the RGP lens and cornea following fluroscein instillation. Bearing /touch: The dark zone where the RGP touches the cornea.